You’ve mastered the Basic Pant, Pants with a Lining, and the Flat Front. 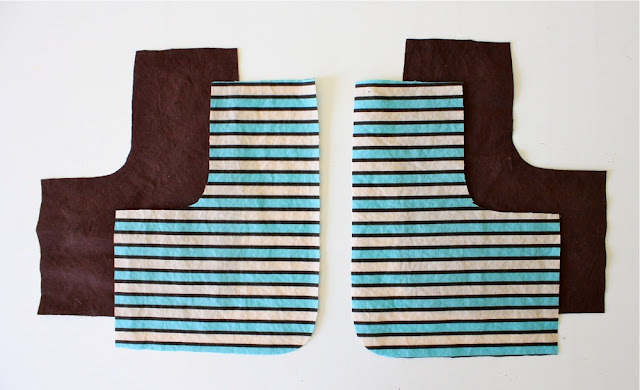 Let’s add one more detail…Pockets! Adding visible front pockets to pants are easy. Of course there are fancier ways to do it (such as enclosing the top of the pocket inside a separately sewn-on waistband). But you know I like to keep it simple. So that’s what we’re doing here. 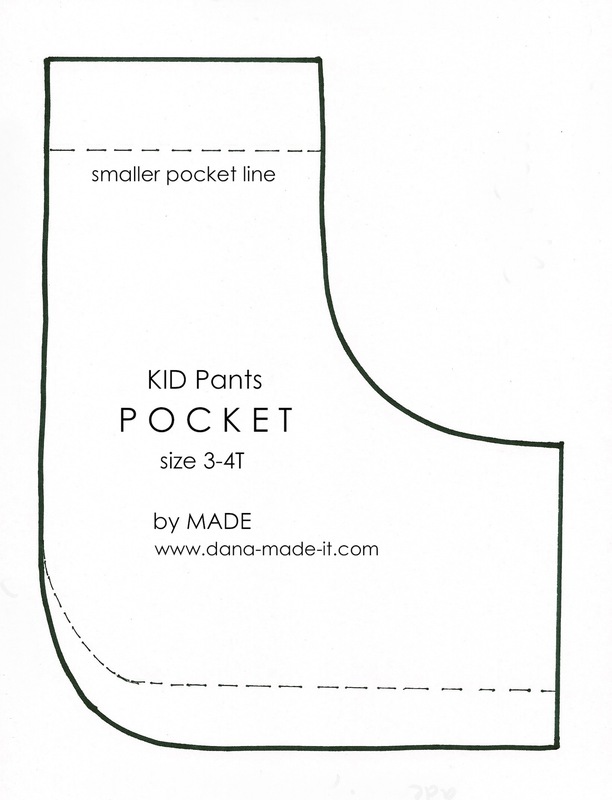 Simple pockets for complex kids. Oh, why does he look 16 already? The teenage years are gonna kill me. 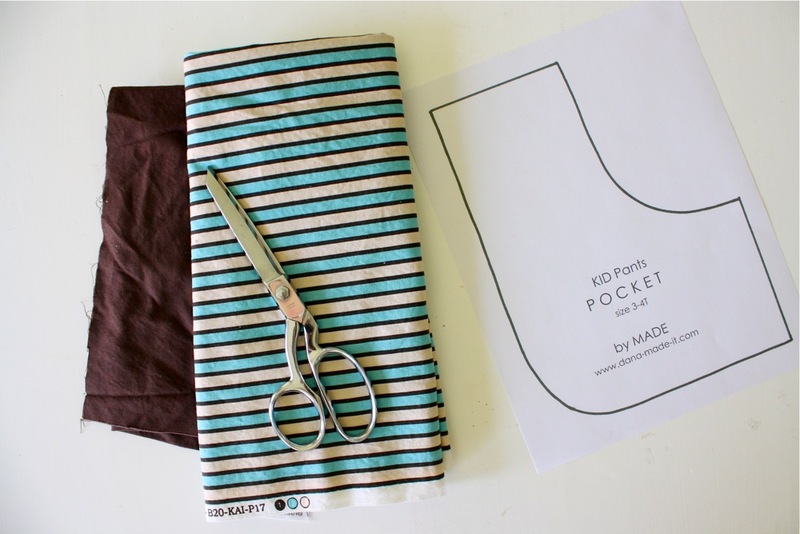 This post is actually an updated version of the original pocket tutorial, with improved photos and….a printable pattern piece! Yay! But any way you make them, they’re perfect for picking up rocks and tucking them away. Also, you can tell the pants are a bit baggy here. I added an extra 1/4 inch everywhere when I cut them out, for my growing boy. I’ve already washed/dried the pants once and they shrunk up a bit more. I’ve noticed that even when I pre-wash my fabrics, this tends to happen. Okay…. 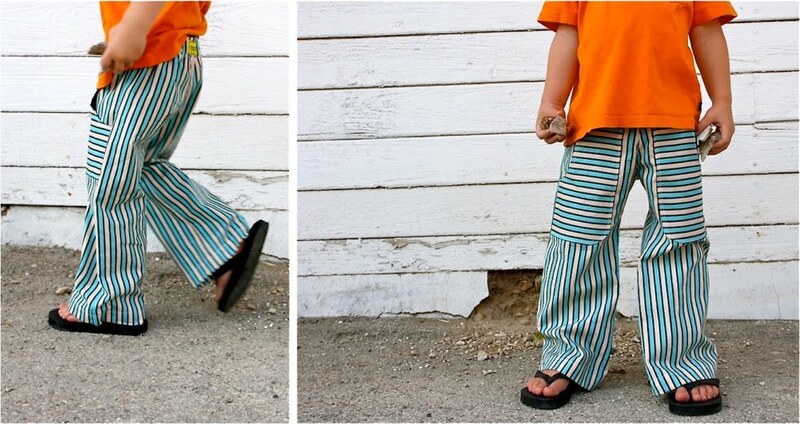 For this pair of pants, we’ll pull from the previous Flat Front Pants Tutorial. 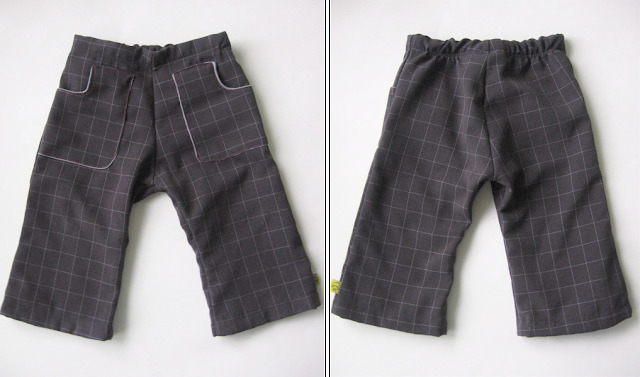 Pockets could also be sewn to the Basic Pant but they look so much nicer with a smooth flat front. 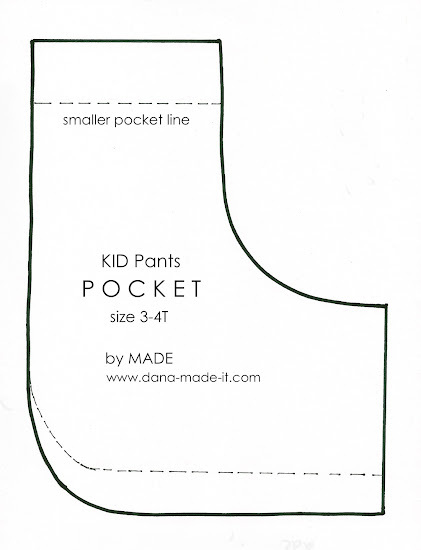 Print the Front POCKET pattern HERE. * If you don’t have a printer, place a piece of paper over your computer screen and trace! The pattern looks like the photo below (but you’ll want to follow the download info above, so you can print it to actual size). You need two layers for each pocket (the outer pocket fabric and a lining fabric). You can use the same fabric for both but I like to mix it up a bit just for fun. The striped fabric here is from Hobby Lobby clearance. So the total cost for the pants was only $2! And with the pants fabric, lining fabric, and pocket pattern, we’re ready to go. 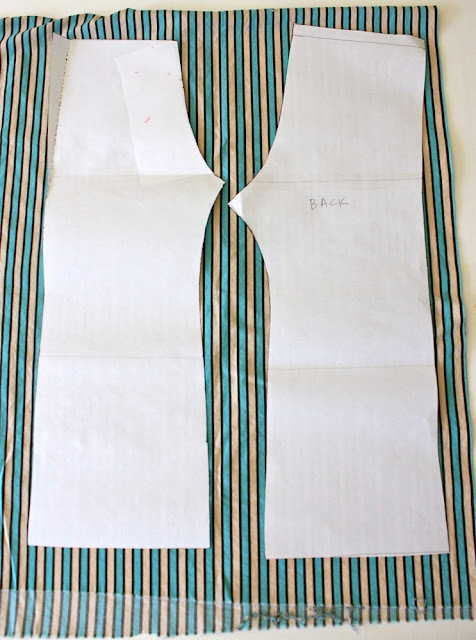 As outlined in the Flat Front Tutorial, lay out and cut your pants pieces. Okay, next cut out your pockets. NOTE: I wanted the pockets to stand out and give contrast to the pants, so I turned the fabric sideways. 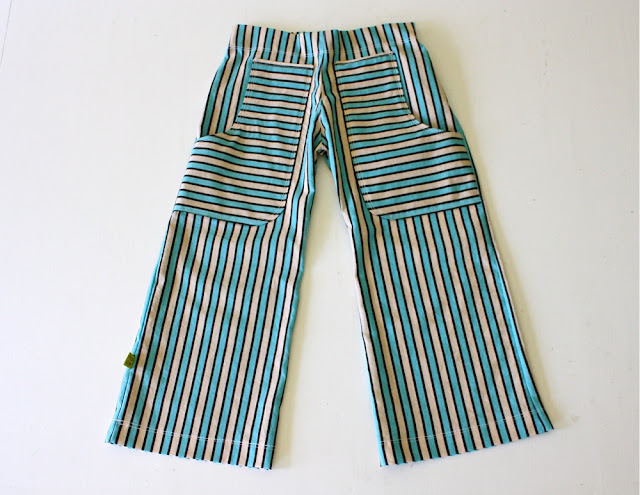 Now the pockets have horizontal stripes, while the pants have vertical stripes. Fold your fabric in half (so you end up with two opposite pockets) and cut two pocket pieces. 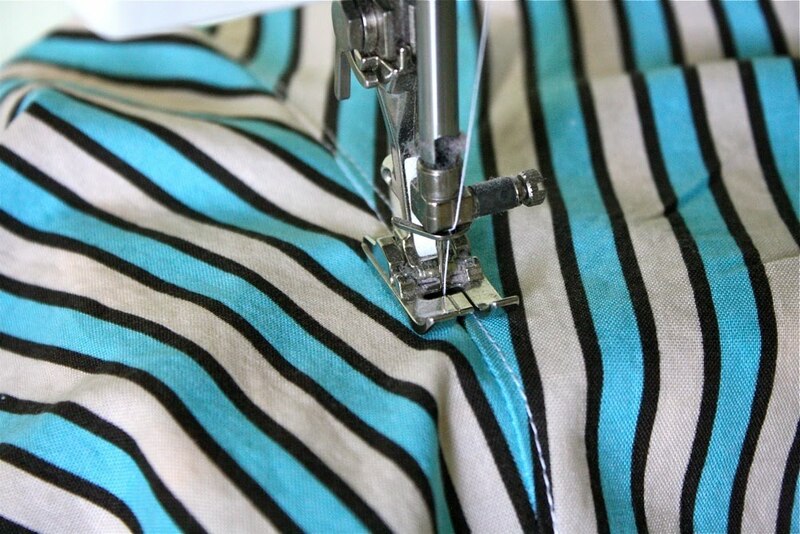 Try to match up the stripes on both sides of the fabric so your fabric print will look similar on both pockets. Cut out two lining pieces also. With right sides of the fabric together, pin each pocket and lining piece together. We’re going to sew these together and turn them right-side out to create a nice, finished, pocket edge. Note in the photo below that you do not want to sew the side of the pocket. Leave it open so you can turn it right-side out. 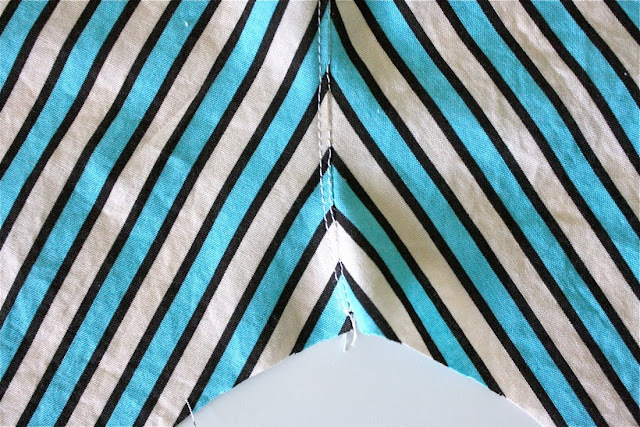 Sew from one side, around to the other, using a 1/4 inch seam allowance. Snip the fabric at the curved seam a few times. This will help it to lay flat. Turn the pockets right-side out, pushing everything out at the corners and seams. Now we need to finish off the curve of the pocket with a top-stitch so that it will eventually match the rest of the pocket stitching. 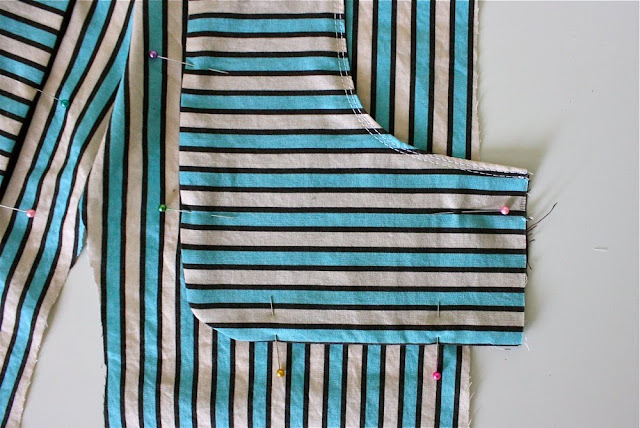 Sew a top-stitch line about 1/8 inch from the edge of the curve. I prefer a contrasting thread color, so it pops and stands out. 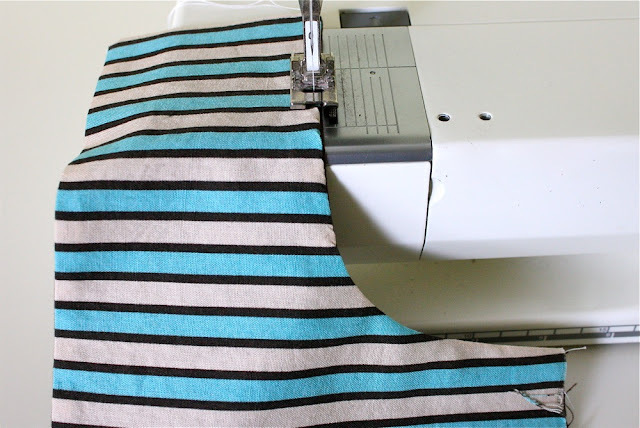 If you prefer double-stitching (but you’re too lazy like me to get out the double needle), move over another 1/8 inch and sew a second line, parallel to the first. Sew your pants up to the first step–sew the two front pieces together. 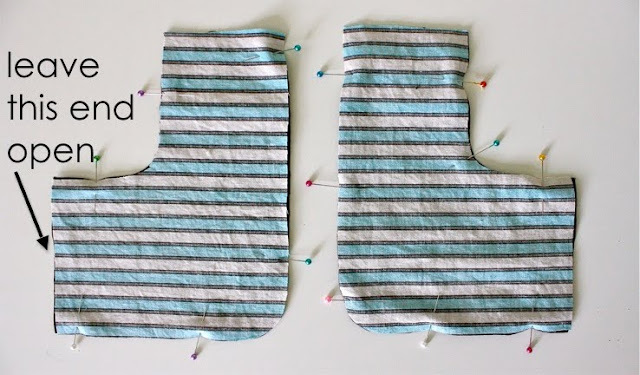 Lay the pockets on top and space them where you’d like. 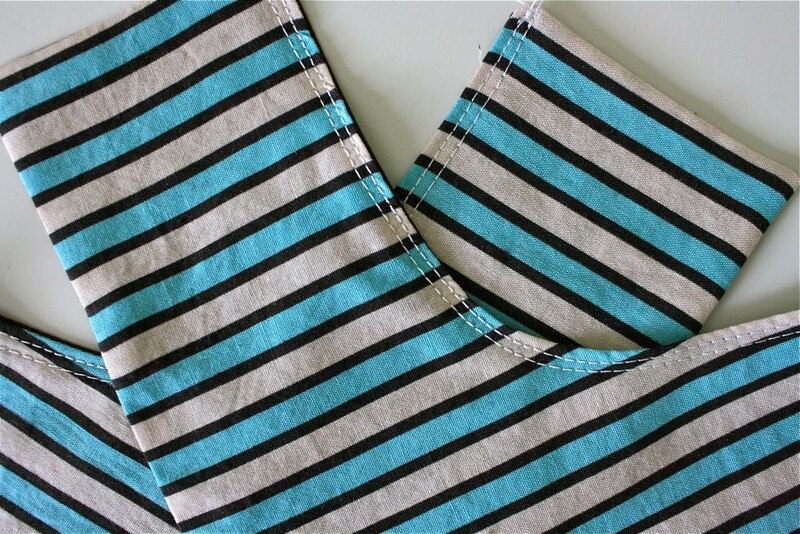 Remember that the top waistband will be folded down about 1 inch, so account for that in your spacing. 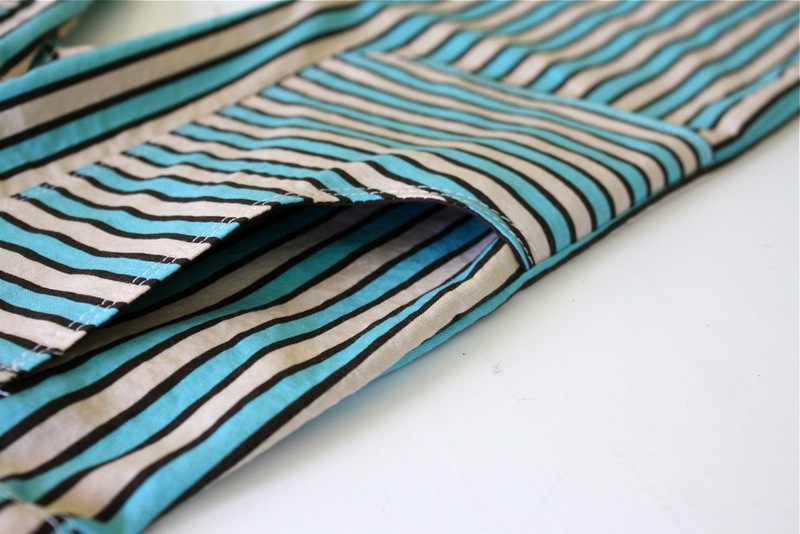 Pin both pockets in place and don’t worry that they overhang the side seam. That’s intentional, to allow you plenty of room for placement (the pocket will be sewn right into the pants seam and you can trim off the excess). Sew the pockets to your pants, 1/8 inch over from the edge of the pocket. Sew all the way around and remember that you do not want to sew the curve of the pocket closed! 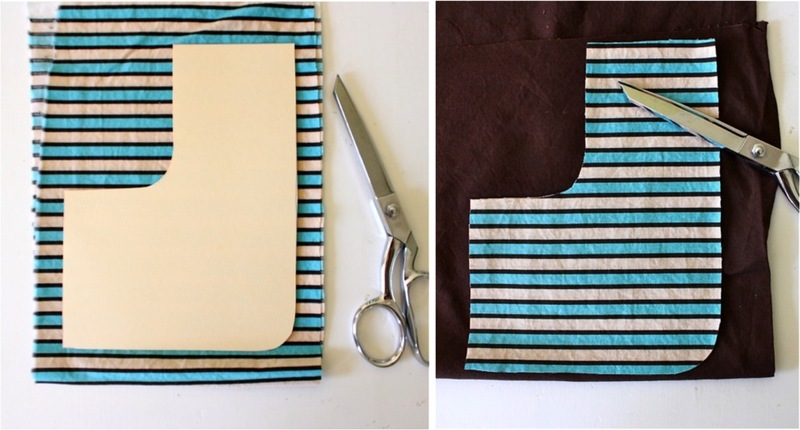 Do a double stitch on everything and your pockets are in place. 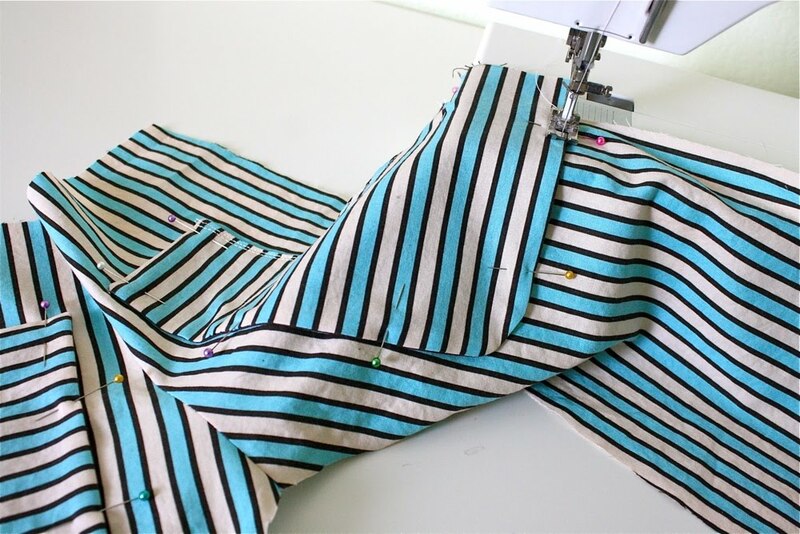 Continue sewing your pants together, as outlined in the Flat Front Tutorial. 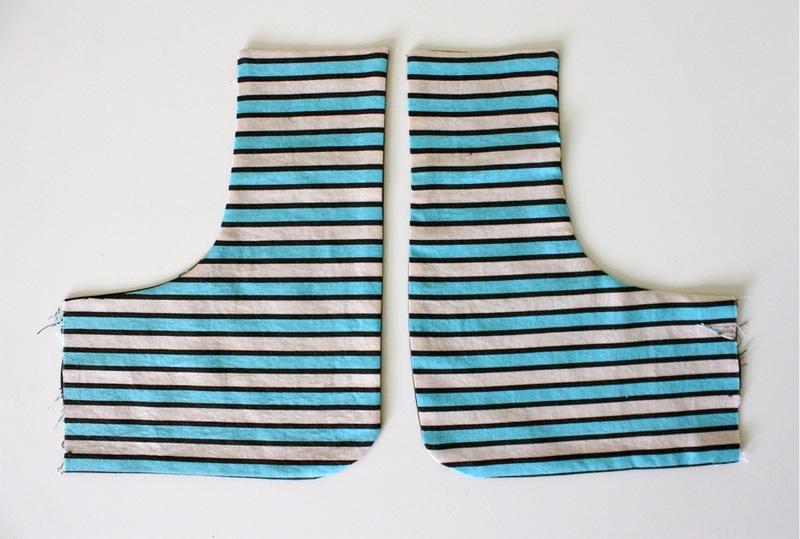 I also decided to double top-stitch the front and back crotch seams so it would match the stitching of the pockets. Flat Front Pants with Pockets! Time to fill them with treasures…. Thank you so much for this tutorial. 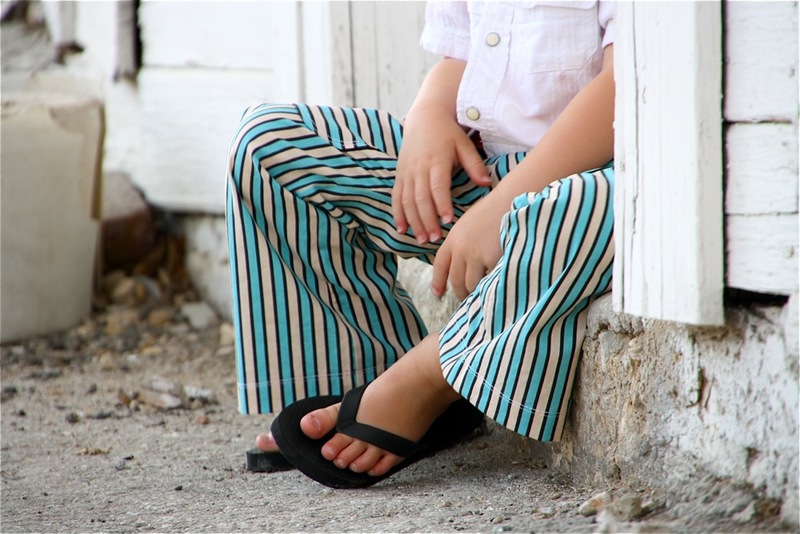 I drafted my first pair of boy pants with it. Awesome! great! The fabric is from Hobby Lobby, last year. Sorry 🙁 That doesn’t help you much. Thank you so much for your different tutorials-I´m from Hamburg, and sometimes I don´t understand all the” sewing words”-but your way of discribe is wonderful and easy-and:I LOVE the way you dress your son! Hi! These are GREAT! 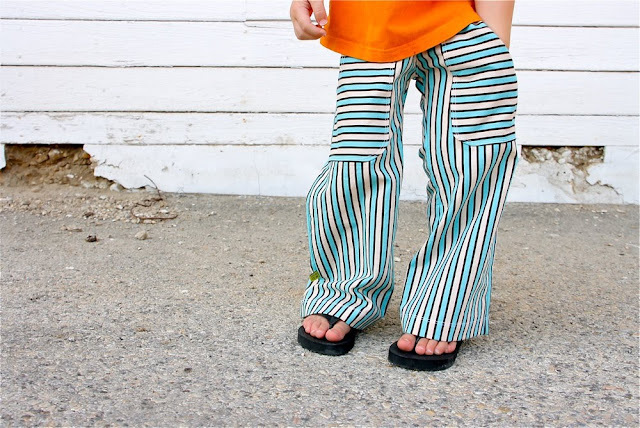 My son is so tall and skinny that store-bought pants never fit right. 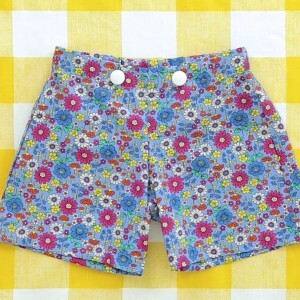 Going to make some of these for summer….and perhaps shorts using the same pattern. 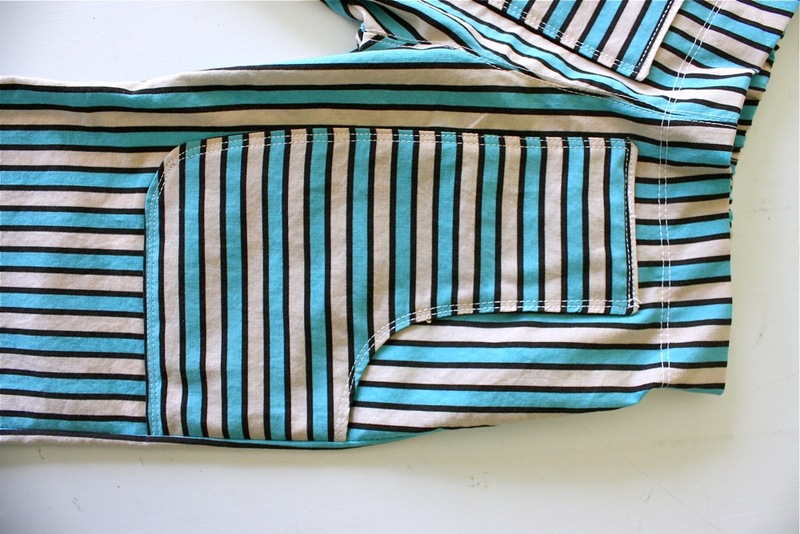 Quick question….is this an elastic waist? Do you have a tutorial that shows how to finish the waist? if you check the “kid pants the basic pants” under tutorials, top right corner. There are the step by step instructions and pattern to make that basic pants for all of the pants Dana has. You use the basic pants and add knee pads, pockets, flat front, lining, cut to shorts, whatever! I am in love with these pants! 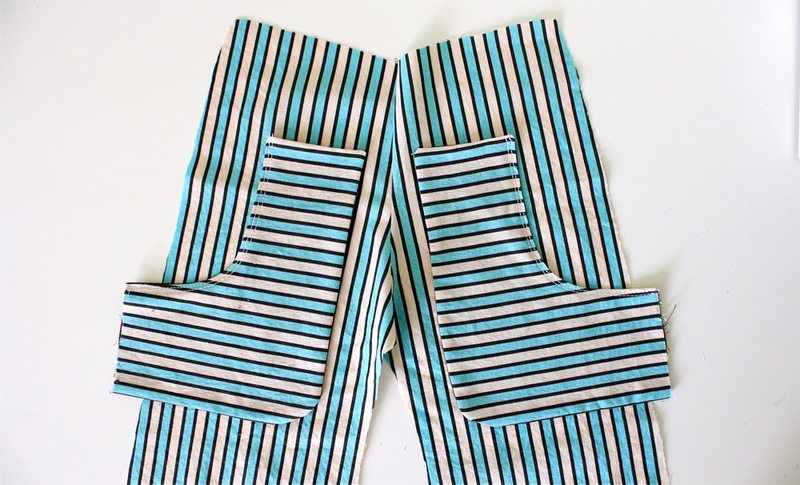 Thank you so much for these pant tutorials and the downloadable pattern. I have made 3 pairs, and I have fabric to make 3 more. I adjusted the pattern to fit my 5 year old and then to fit my 20 months old baby. I’m so addicted to making these. I can’t stop! I would love to make these in adult size. I think I will give it a try, thank you! Hi Dana! Thank you for this. I recently completed your Basic Flat Front Pants using a simple blue and white stripe oxford cotton fabric. 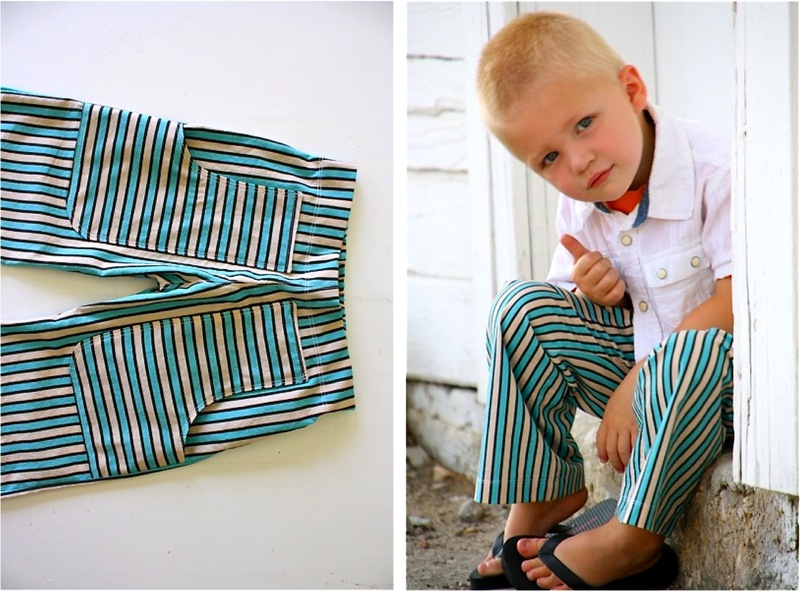 It was a success, except that when I showed it to my family, they all said, “Wow, you made pajamas!” I was a bit annoyed because I wanted so badly to copy the striped pants in your tutorial for my 6yr old son. Anyway, I guess I used the wrong fabric, maybe it’s too thin and, well, pajama-ish. Now, I think this will make the pants look more outdoorsy with the cute patch pockets in perpendicular direction. Maybe I can also add outer patch pockets at the back so it won’t look like pajamas. Yay! Thanks again. I need to grade this up to an 8 – 10. Help? Thanks so much for sharing. I’m a big fan of your tutorials. Keep them coming please! I just started sewing & reading your blog. Thanks so much for sharing your knowledge and your patterns here for the rest of us! 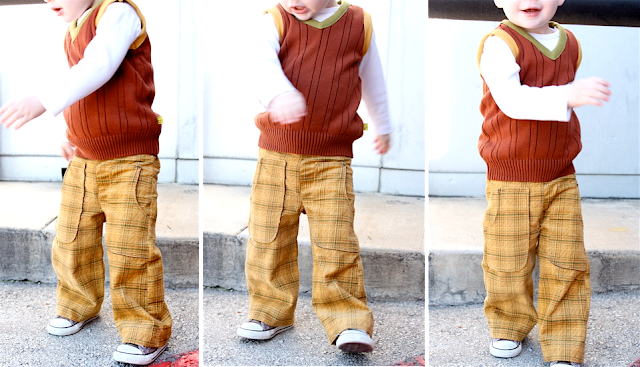 I also have a skinny 3 year old so I’m thrilled to see your patterns fit him so perfectly. 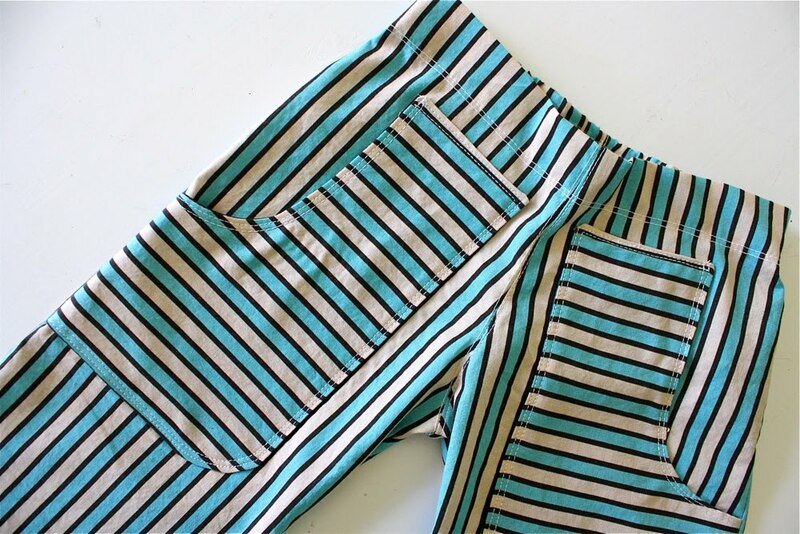 One question regarding these pants – I love the look of the double stitching but am having a hard time making them stand out — even with contrasting colored thread. Are you using a heavier thread than just your standard all purpose thread to make them pop like that? And if so what kind? Thanks for these great patterns. I made a flat front lined pants with pockets. So three of the tutorials in one shot :-). It turned out great! hey dana as im getting ready for “the boy” i just realized there are only for 2-3t… how much extra should i add for 4t so you think?? 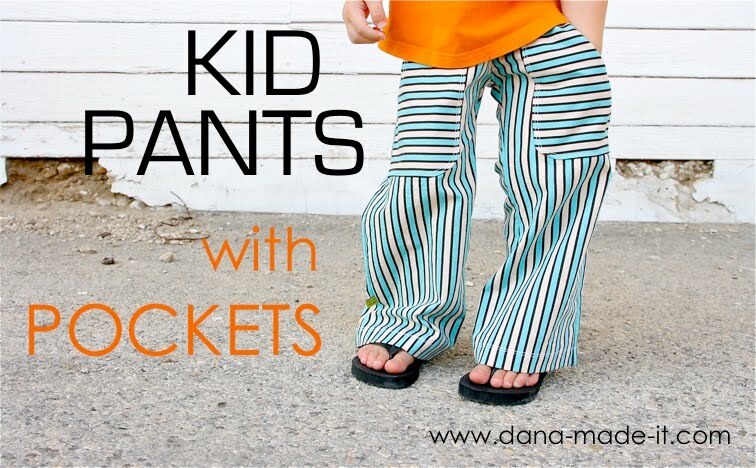 I would grab a pair of your son’s current pants and gauge how much extra you need to add. What a handsome young guy you have & thanks for the tutorial, with 3 boys I need pants galore! Here’s one of my finished products! I topstitched along the very top edge of the waistband all the way around this time, and I think it helped me get the waistband to behave. Thanks for the great pattern! Already have a couple more in the works! Thanks for the great tutorial and pattern piece. 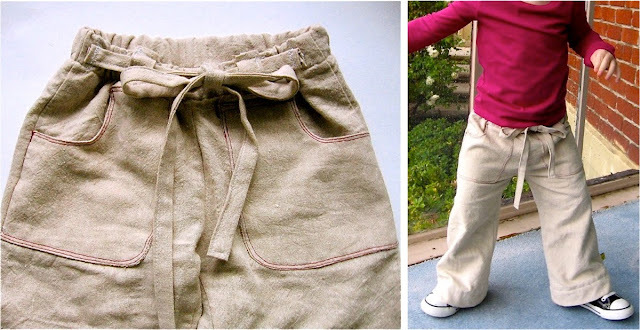 I used it to add pockets to a pair of shorts for my daughter. She is wearing a size 10, but the large work great.